Dr. Kelley chose the word “radix” from the Latin work meaning “root” or “source,” referring to that force which underlies all movement, feeling and growth in a person and in life. The goals of Radix work are to help people become more fully alive and more authentic. Radix work is applied uniquely with different clients according to their individual needs, and yet common themes underlie the work such as mind/body integration, grounding, centering, creating effective and flexible boundaries, developing the ability to express or contain feelings, ego strengthening, pulsation in the body and in life, intimacy, pleasure, choice, and awareness. The Radix Institute is a nonprofit organization that educates, trains and certifies people in the Radix approach. 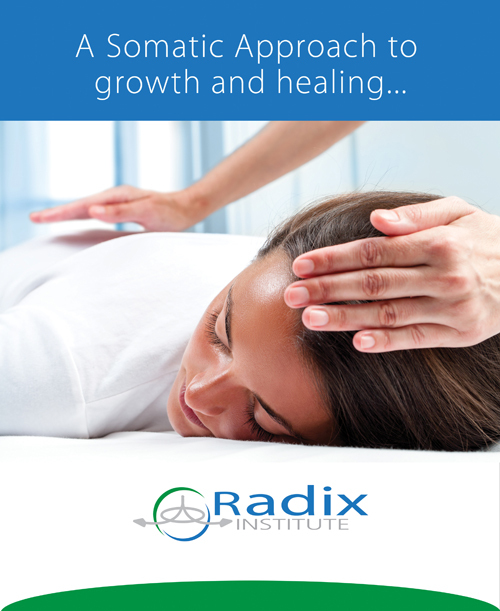 The Institute also provides continuing education and other professional services for Certified Radix Practitioners. The Institute is managed by a Circle of Management which is a democratically organized governing structure. The Radix Institute is nurtured by a vigorous, warm, diversified, and ever-creative community of gifted trainers and practitioners. Radix work is practiced internationally. The Radix Institute certifies practitioners, and practitioner members of The Radix Institute stay current with developments in training and agree to adhere to the Ethics Code of The Radix Institute. There is also a training center in Australia, and many practitioners in Europe.